In this series, I will start discussing all the Zerodha Kite indicators one by one. The first indicator on Zerodha Kite is ADX/DMS, so I will start on the ADX/DMS Indicator on Zerodha Kite. What is the full form of ADX/DMS? The full form of ADX is Average Directional Index and the full form of DMS is Directional Movement System. 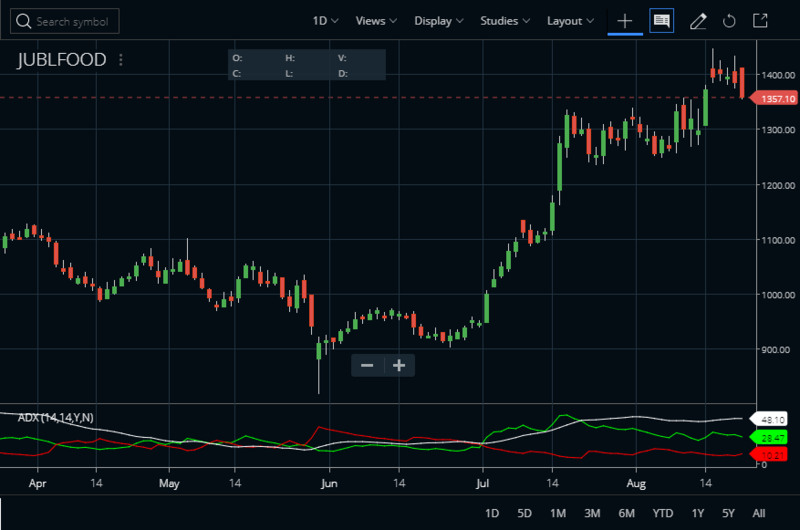 How to Add the ADX/DMS Indicator On Zerodha Kite? Open any chart on Kite platform. Choose ADX/DMS from the dropdown. Now you can see the ADX/DMS indicator attached in the chart. The default settings are ADX Period of 14 and Smoothing Period of 14. See the image below. 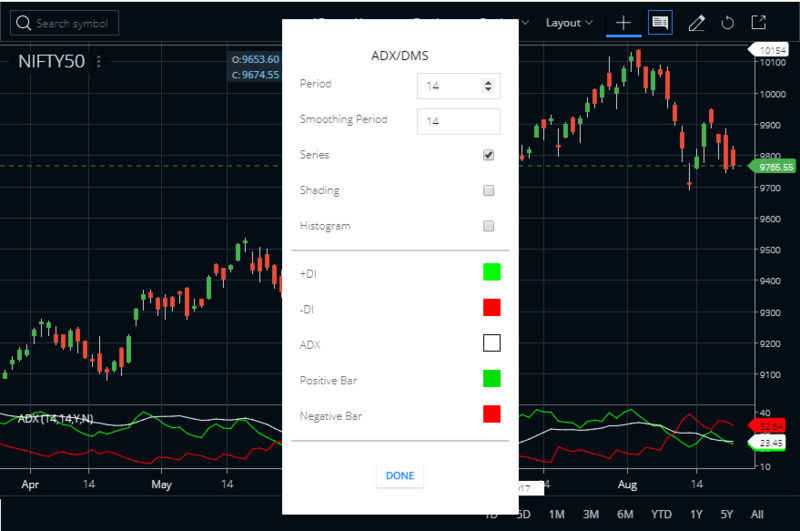 How To Trade With The ADX/DMS Indicator On Zerodha Kite? The ADX/DMS indicator consists of 3 components. The +DI or PDI line – shown on green colour. The -DI or MDI line – shown on red colour. The ADX line – shown on grey colour. The PDI and MDI lines gives buy and sell signals and the ADX line shows the trend strength. 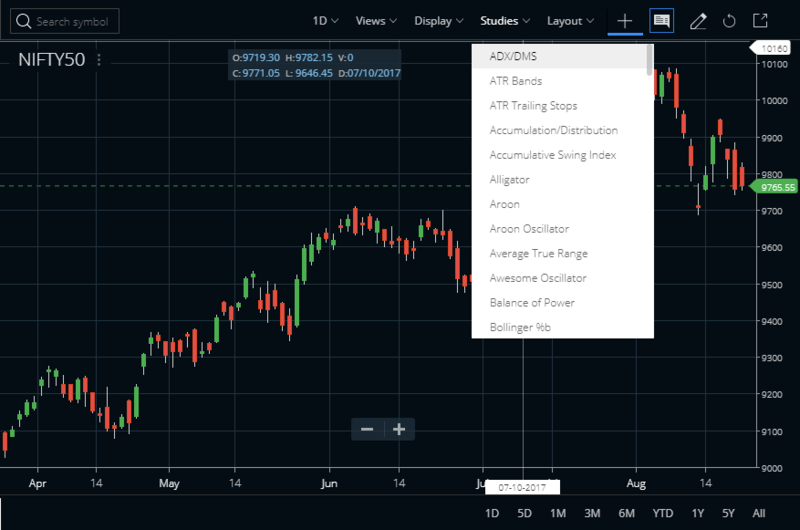 How To Interpret Buy / Sell Signals From The ADX/DMS Indicator On Zerodha Kite? PDI line crossing above MDI line is a buy signal. PDI line crossing below MDI line is a sell signal. The ADX line rising is a trending market. When the ADX line is abive 25 and rising it is a properly trending market. The higher the ADX value the greater the trend strength. On the other hand ADX line falling and below 25 denotes range. So a trader can change his / her trading style using the ADX/DMS indicator on Zerodha Kite. When the PDI is above MDI with a rising and high ADX reading he should consider only buy orders (either buy on breakouts or buy the pullbacks). And when the PDI is below the MDI with a rising and high ADX reading he should only consider short selling orders (either short sell on breakdowns or short sell on pullback rallies). In a lower ADX reading below 25 or best below 20/15, a trader should employ range trading techniques. He can buy on dips as well as short sell on rallies. Both the methods can be used on intraday (5/15 minutes chart) or swing trading (hourly / daily / weekly charts). A high reading of ADX in JUBLFOOD. PDI is above MDI – the stock is in strong uptrend. Buy the breakouts as well as buy the pullbacks. The PDI and MDI lines are used for generating buy/sell signals whereas the ADX line is used only to judge trend strength. Remember, a high ADX does not denote a direction, it only denotes the current trend (can be either UP or DOWN) is strong.